Desperate for a much-needed international sales boost, Russia’s Sukhoi Civil Aircraft Corporation (SCAC), producer of Sukhoi Superjet 100 (SSJ100), has announced another interest from a non-Russian customer. 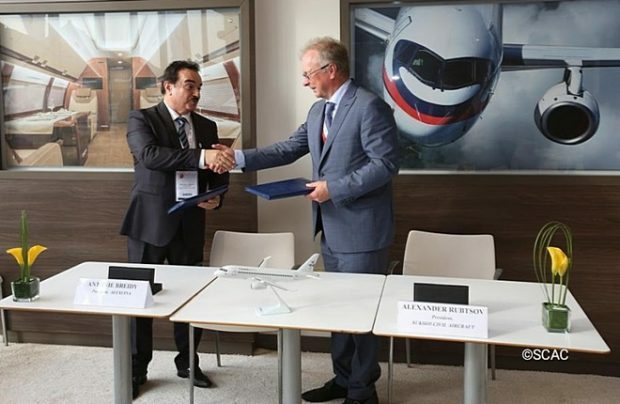 SCAC and Alexcina LLC, a US-headquartered air charter specialist, have signed at Bahrain Air Show a Letter of Intent regarding the potential purchase of a series of Russian-built Superjet 100 regional aircraft. “The parties are expected to continue the negotiations on the delivery of up to 12 SSJ100 aircraft for further operation in the Middle East region and other countries,” says the Russian jet manufacturer. The aircraft could be delivered either to the Alexcina Airways daughter company or to “other Alexcina customers” as early as next year. Alexcina Airways is believed to be based in Lebanon. The likely aircraft configurations – and the terms of their delivery as well as other details – will be defined after further discussions. In its efforts to boost international sales of the regional aircraft, this year SCAC has been actively engaging with potential overseas customers and has signed a number of similar LoIs with international companies, albeit exotic, including Aeroperu International in July, Aero Mongolia and, reportedly, Iran Aseman and Iran Airtour in April. The only overseas delivery of the Russian regional jet so far this year was delivery of an SSJ100LR aircraft in VIP-configuration to the Royal Thai Air Force.